This cookie is intended to be use with all organic ingredients. Preheat oven to 350. Mix all the dry ingredients into a bowl and set aside. Into your electric mixer cream butter, sugar, honey and oil. Add eggs and vanilla. Slowly add dry ingredients. Add nuts at this time if adding to recipe. Add in apple and lemon juice. Ideally chill dough for ½ hour. Using a cookie scoop place 12 on a sheet, cookie will spread. Bake 8-10 minutes. Easily makes 3 dz. Hope you give them a try and love them, too. That’s how this post started when I sat down to write it a month ago with intentions about finishing it many times since then. To say it has been a busy month, well just ask the kids. While at my girls’ weekend at my mom’s, I had severe neck spasm. Severe meaning I was unable to lift myself up out of bed or a chair. Grateful for my dear friend who happens to travel with a pharmacy in her bag, I endured. Once home and a conversation with my hubby had me doing what I knew I need to do a long time ago. If you don’t know it , my husband is a vegetarian almost completely vegan. It really goes deeper in that he is very conscientious of the benefit and how the food is grown (genetically modified foods). He really is a wealth of information on nutrition. So when he suggested I consider doing a detox, I knew he was the verbal voice I had been trying to quiet in my head for several months. I’d done a detox diet before and knew how good it made me feel. I had followed the guidelines of the Daniel Fast. So once again, I cut it all out: whites, yeast, sugar, dairy and meat. Many people look at the list of “don’t” s and wonder what is left to eat. And I’ll admit, in the beginning, I tend to think the same thing. And that thinking of “woe is me” last for about a week and I find it gets easier. I’ve kept it up for over a month and I do feel pretty darn good. I’ve “cheated” here and there. I am trying to change my way of thinking, and since I’ve been accuse of being hard-headed, this won’t be easy. I have lots of reasons for changing the way I eat, arthritis at an early age for one. Secondly, both of my parents have had cancer. Praise God both are cancer free now. The cancer is on both sides of my family as well. I’m surviving without the meat and I’m doing alright with the dairy part, but can I tell you how much I miss the sugar. I think it’s my drug. I love to bake and eat what I bake. I miss it and so do my kids. I think my push is to go all organic. My plan is to go to baking all my own bread including grinding the wheat. I’ve learned that even the whole wheat flour sitting on the store shelves have lost all their nutrients. I love to eat, but the time has come to eat to live. I want to do all this though without making it an idol. So quickly and as easily we can turn our health into an idol. It can consume our thoughts and plans. God has given us so many wonderful things to eat and enjoy. And the same time, when you know better about what and how your food is grown or manufactured, you need to not ignore the facts. Unless of course, ignorance is bliss. For me, I need to take the time to set up my boundaries and then live within them (enter the hard part). The obvious benefit of all this “eating right” is losing a few pounds and the jeans fit better. My skin looks better, too. My arthritis has not bothered me either. Yes, it does cost more to eat organically, however, in the end it just might be cheaper. You tend to eat at home more and in the long haul, less visits to the doctor’s office. If you are at all interested in knowing what you are eating or how it is grown, start with an easy find and watch Food, Inc. You can find it off of Netflix if you have a subscription. From there you can move on to King Corn. Our church as actually just entered the 21 day Daniel Fast leading up to Easter. So at least for a while, I have plenty of friends eating the same way so we can enjoy lunches and dinners together. The fast start of jumping into this strict way of eating is difficult, in truth, removing one thing at a time would be much easier and would lead to a lifestyle change. Which is exactly how my husband did it. I don’t plan on giving up meat completely, but I do plan on eating much less. I’ve not made up my mind on dairy, although I suspect it is the trigger to my arthritis pain. I’m hoping my changes will lead to a healthier lifestyle for me and for my children. I’m like a little kid. As soon as I finish a quilt, I have to give it to its new owner. So last night, I got in the car to go a whole mile down the street to our friends, the DeGenaros. Last year, these dear friends said goodbye to their son, Christopher. Chris’ life was a miracle from the start. He was never expected to live past his first days of life, and yet God gave them 12 years together. The lives he touched are countless. After a fight with leukemia, God saw fit to bring him home to Him. If you knew Chris even a little, you knew his passion for books ( a boy after my own heart). 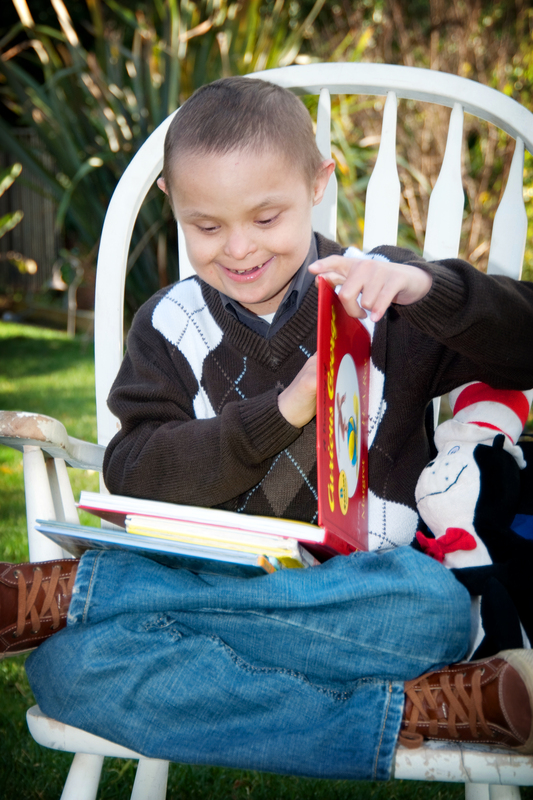 His favorites were his Dr. Seuss’ books and especially Cat in the Hat. Stan and Marisa have started a foundation in his honor called Chris’ Korner. I love you, dear friend. May you feel the love. What do you do with all of those? It’s a question I’ve heard more than once when it comes to the quilts I create. I also hear, do you give them away? 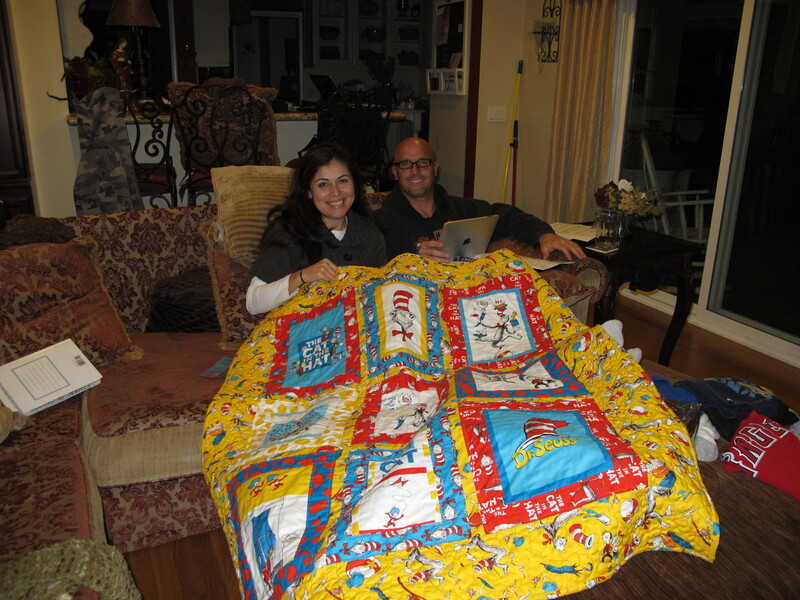 do you quilt for charity? Makes sense to ask, after all, what am I doing with all these quilts? Preparing for an Ice Age! Using them to hold down the couch. Going for the Early American Quilt look. 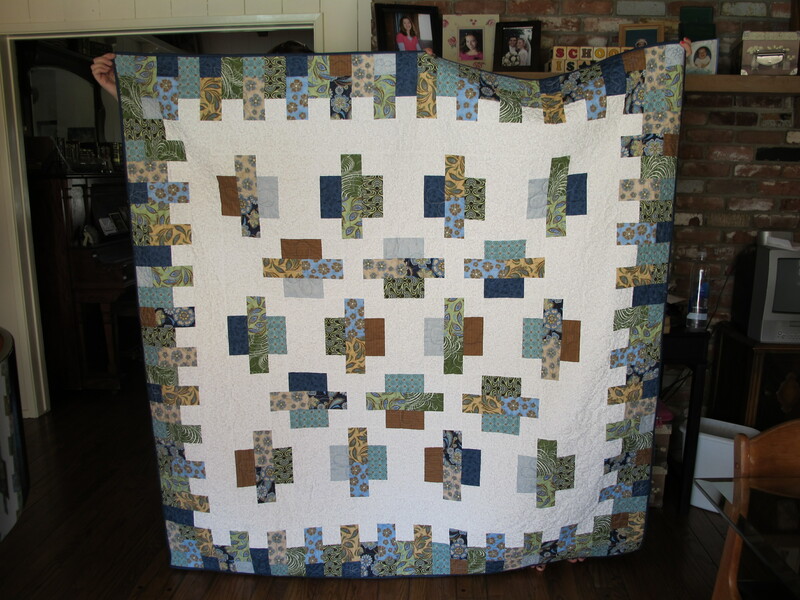 I remember one of the first I did, my Americana quilt. I took to that project prior to 9/11, but finished it after the attacks. Call it quilt therapy. It became the first thing you tried to claim when watching tv in the family room. I shamelessly admit, I often demanded back from a child more than once. 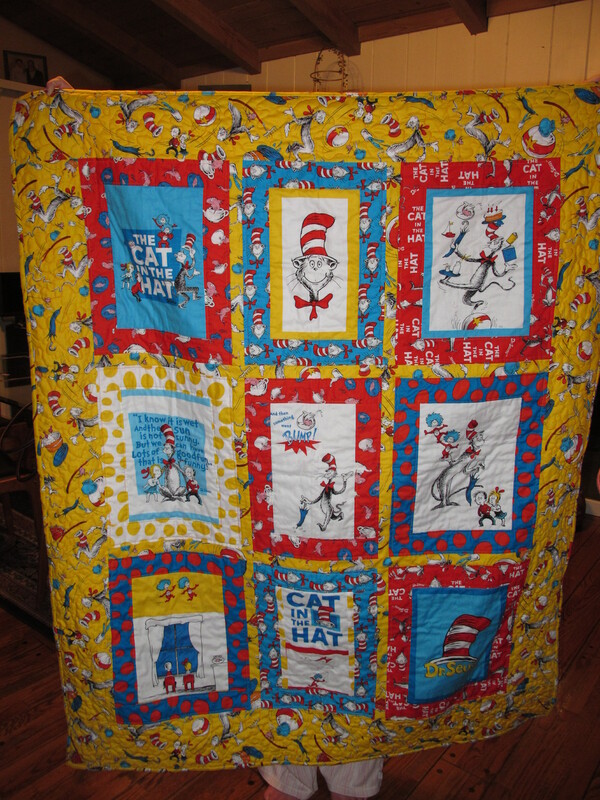 I then moved on to making one for each child and created more for the family room. 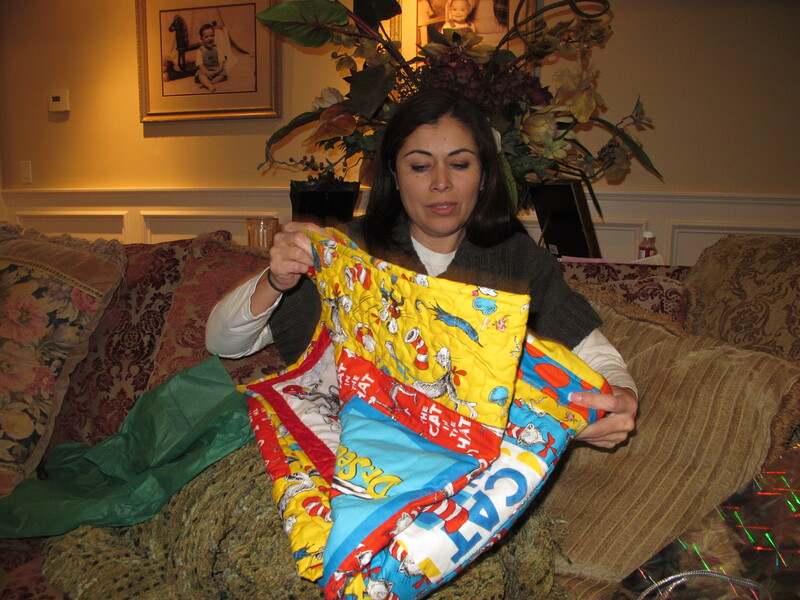 The ultimate question was always, “when are you going to make me one.” I had to come up with an answer, so it became, “give birth or get a life threatening disease.” And for the most part, that’s who received a quilt from me other than my immediate family in the first few years. I’ve branched out since then. It’s not always easy to give them away! You pour so much of yourself into each one. What if they don’t like it, or use it, or think it is hokie? Forgive me, it’s the ugly human side of me that cares what someone thinks and the extremely sentimental side of me that is attached to a thing. (sheesh, I’m not looking so good up til now.) My bestie and partner in quilting crime shared a story once with me about a quilt she gave away. She has always wondered if it was loved and said this to another quilter. The lady told her that with each quilt she gives away she had to imagine it being thrown into a river. She told Shannon, you have to give it away not knowing if it will be cherished or used for the dog to sleep on. We admit that neither one of us is quite there yet. We just might be a bit too passionate about our efforts. There are a few out there that I have no idea what became of them. 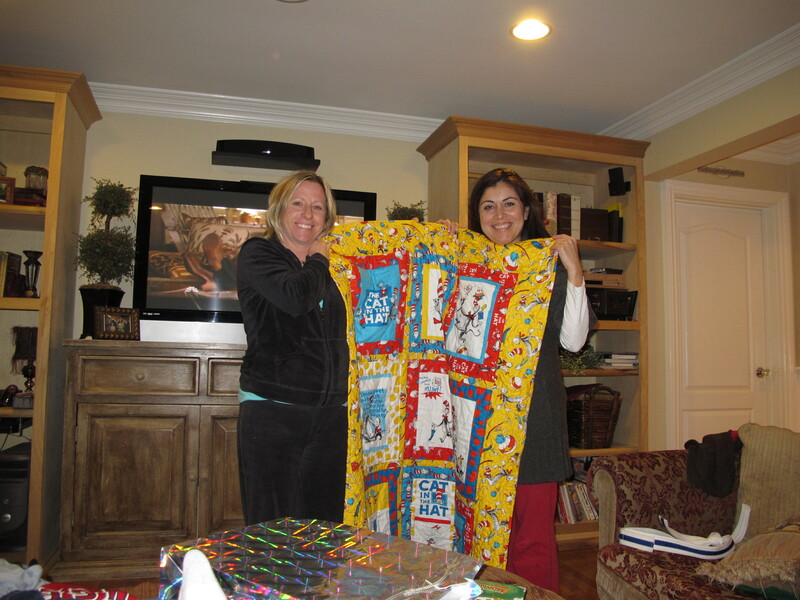 My sweet friend, Amanda, who told me their quilt had medicinal powers when she was sick recently. If she only knew how much she ministers to our family with her love. Or knowing that our little buddy, Declan, sleeps each night under his. Skyping with the Bartles and seeing theirs draped on the couch fresh from a recent cuddle. Just maybe it means she knows that even though she lives almost 200 miles away, there’s a little piece of me with her always. And after the funeral of a friend, taking the quilt I gave to Clara during her battle with cancer and placing it in her mother’s arms. I hoped she would always know just how special she was to us. I’ve tried to count the number I’ve given…but it doesn’t matter. I gave each out of my love for them. Some with hope, some with rejoicing, some with tears, but all given with prayers and thanksgiving. I’ve got a chest filled with material for many more quilts, it’s really all part of managing my addiction to fabric. I’ll keep making them and finding a place for them. It’s what a quilter does, well, at least this one. If you only could read all the posts I’ve written in my head! I always imagine I’ll keep this so much more current than I do. Wishful thinking, I know. And since September so much has happened: numerous Disneyland trips, getting through the first half of our school year, a daughter getting accepted to college, Thanksgiving, Christmas, birthdays, and a whirlwind of quilting. Pictures are all over facebook. It’s amazing how much life we manage to cram into life. My son remarked that it had already been a month since Christmas and I was somewhat surprised by it. I’m always amazed by some to the yearly events that come rolling back by so quickly. And I don’t mean just the birthdays and holidays. I have three that I really look forward to every year and they are all in January and February. Selfishly I love them so much because they are centered around the things I love so much! The first just passed, Road 2 CA quilt show. Four days of fabric, fabric and more fabric and a chance to play with it. Secondly, it’s the Wholehearted Mom’s conferences by Sally Clarkson. It’s so inspiring, challenging, and convicting, all in a positive way. It’s the boost I crave and often need this time of year. And thirdly, it’s a weekend at my mom’s with a couple of my close friends where she feeds us wonderful foods and we get to do whatever we like. Whether that be scrapbooking, sewing, watching movies or reading books, but it all ends with a long soak in the mineral hot tubs. It doesn’t get much better, well, there is Maui. While the days do go by so quickly, I am glad the memories don’t. This February it will have been two years since Bert surprised us with our vacation of a lifetime. Yet, I can remember it as though it was a week ago. Isn’t it good of God to let us have those wonderful memories to draw on. Imagine if you only enjoyed something while it was happening. I realize that there are tragedies we wish we could apply that to, I know I have a few. So enough of my ramblings…I’m off for more memories and the cramming of life into life. I remember back to turning 30. I didn’t want to do it! How could I possibly say good-bye to my twenties. Seriously, the twenties are for all the hip and fabulous people. The thirties are for, well, let’s face it, our parents. My parents were in their thirties when I remember thinking they were old. Now I was having to wear a number with a “3” in front! I eventually got over it. But then, I had used up ten years of living and was faced with turning 40! As it was approaching, I didn’t want to repeat the emotions I carried around at 30. So I bought into the 40 is fabulous mentality. I kept repeating it to myself even if I didn’t believe it all the time. Until, I really started thinking about all the things I love about being this milestone age. It’s the most obvious, but bears repeating, Knowledge. Just think what you know now that you didn’t know at 30 or 20. As a home schooling mom of three, learning is something I am surrounded by each day. As my kids continue to show themselves as well as me, some lessons come easy and others come only after the tears. Mistakes are only opportunities to learn how not to do something. Knowledge simply for the sake of knowledge really doesn’t appeal to me. At this stage of living, I want to learn so I grow or help others around me to grow. I have a hard enough time keeping appointments, a never ending to-do list, and my name straight, to simply fill my head with stuff. You learn to stop fighting certain (not all, let’s not go crazy) situations, realities, and people. You mellow out and begin to learn to just breathe through it all and sometimes…right on past. You begin to like yourself. Not in a self-absorbent, jr high sort of way, but rather you see your own possibilities. This just might be matched with letting go of unrealistic dreams or expectations and grabbing hold of some new ones. Better yet, asking God what He wants for your life. You stop wondering why not everybody likes you and instead you celebrate, I mean, make it one to remember, the amazing people in your life. When I stop and look around at the friends in my life, I’m speechless! Not easy, I know. Why, how, when…I won the friend lottery! Blessed beyond blessed. Try buying that at Target or Nordstroms. You either come to accept what you see in the mirror when you step out of the shower or you do something about it. You know the laundry can wait and the kids can’t. It’s balance. You’ll find time to clean, but if a better offer comes along, you’ll take it. You’ll drive your kids and their friends to tee-pee a house, fork a lawn, office, or car. I hope and pray, you begin to see others for their possibilities and potential. You know how to work hard! And play even harder, even if you can’t get up in the morning. You’ve had to say good-bye, so you learn how to give a really welcoming hello! People should always be more important and are the best way to invest your time and energy. Besides, you need people to try our new recipes on. You realize a lot from this distance. You ought to be more excited about the second half of it all. Sure you begin to charter some new waters: children growing up, parents aging, retirement plans, college tuition, and maybe even your own health comes into question. But I won’t go back. I am too excited about going forward, even with the bumps ahead. I’m looking forward to new lessons to learn, friends not yet made, and the seeing the fruit in my children’s lives. I’m still good with Jesus coming back anytime He’s ready, but I’m blessed to have made it this far. I knows this post comes off a bit more serious, even more serious than I intended it to be when I had the idea. Be honest with yourself, aren’t you happy to have made it to 40 or 50 or 60? So I’m looking forward to 50 now! I do believe a lot will happen in the next 10 years, ok 9 1/2. I imagine I’ll have married children and hopefully grandchildren toddling around. More than anything, I hope I have a bunch of new reasons why I’ll like being that age. Possibilities…life is full of them. This whole not wanting to have to go to the store for things does feed into my desire to grow and raise as much of our food as possible. Notice the word “desire”, cause the idea and reality of all the work that would involve terrifies me. I am still hoping and waiting on chickens, though. Now that Bert is super organic and ultra health conscientious, he is willing to visit the idea. Hooray! But there will always be things I can’t make or grow. I don’t think we are allowed to have a cow in our backyard? And I’m not real crazy about the idea of butchering our own meat. My laziness for going to the store does have me wishing my oldest had her license. She is seventeen after all. Then again, even when I have her go get a few things for mommy, those of you who really know me, know I will probably be following her in my own car. A dear friend of mine, Amanda, had a Roomba. They named her Rita, I think. You know, those vacuums that go by themselves. So two nights ago when I was up cleaning and vacuuming before going to bed, I was thinking house of tomorrow and wishing for my own Rita. And then…I decided to fix my perspective. I thought about how many women around the world would with joy in their hearts every single day be more than willing to vacuum. Yes, the economy is in lots of trouble and it effects us just like everyone else I know. But !!! I still have a house, food, gas in a car, a car, and two legs and arms that can push a vacuum and wash some dishes. I actually smiled the rest of the night as I cleaned and tidied up for the rest of the week. And the trip to the grocery store…well, it was so worth it. 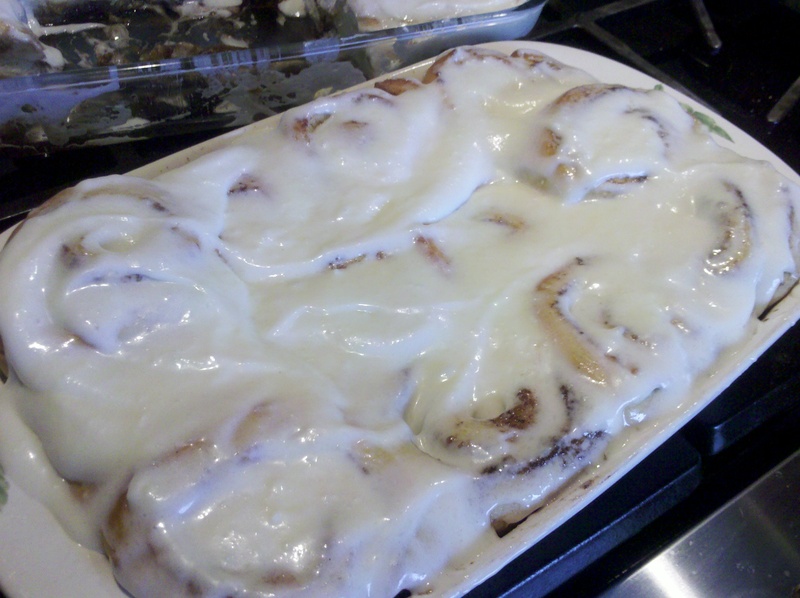 Believe it or not, there are cinnamon rolls under all that icing.